Chardonnay is a grape variety that does not get a lot of love here on my blog. There are times throughout the year that I despise chardonnay and refuse to drink it. Then there are times, like now, where it seems I am opening a bottle almost weekly. I will forever be on the fence with chardonnay, but I have grown to accept it, like it, and more importantly, enjoy it – no matter if it sees oak or not. Right now, I am on a kick with barrel fermented chardonnay. And this offering from Waters Crest Winery satisfied my cravings. 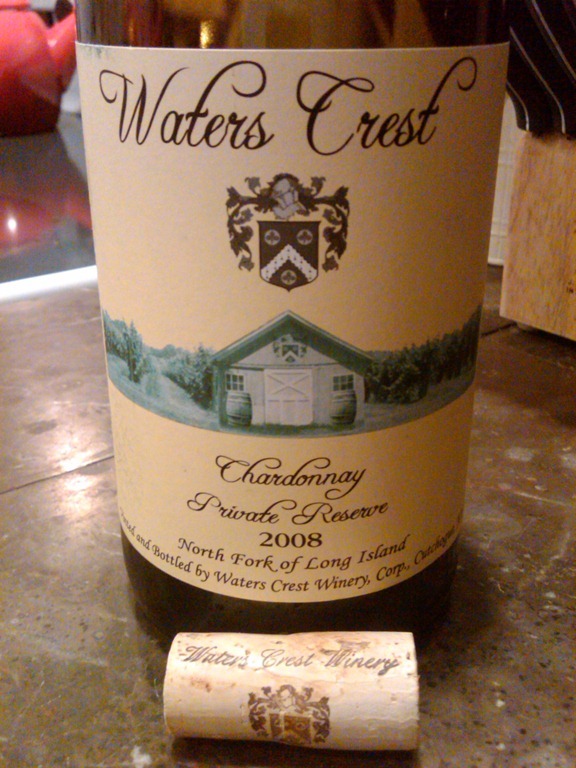 Waters Crest Vineyards 2008 Private Reserve Chardonnay ($25) was hand harvested from Steve Mudd’s home farm in Southold on the North Fork. Steve Mudd is a long time grower and vineyard consultant/manager on the North Fork. Steve first planted vines on his home vineyard in 1974 and since then he has helped many do the same at many vineyards across Long Island. On the nose the wine brought aroma’s of toasty buttered bread with hints of yeast, baked apple and pear and the slightest note of lemony citrus. There was a slight hint of vanilla and marshmallow as well. On the palate, I was picking up notes of apple and spice, baking spice and hints of butterscotch. Zinging acidity balanced out the full body, lush, buttery mouth feel. Flavors of citrus and straw also filled my mouth as the wine came closer to room temperature. I strongly urge you to drink this wine off chill. By drinking this wine cold, which I did at first, squashed a lot of the delicious fruit flavors. This wine was perfect with baked chicken and a creamy and buttery risotto. This entry was posted in 2008, Chardonnay, Long Island, Waters Crest Winery. Bookmark the permalink. I am hit or miss with Chardonnay also but the way you describe it, it sounds like one I would like.